The Thyme Lawns, which are located at the far end of the moat just outside the Herb Garden, are one of the historically defining and much loved features of Sissinghurst. Unfortunately, it has to be said, they’re also an expensive and rather troublesome one too. Our native thyme, Thymus serpyllum, prefers well drained soil and grows on heaths, downland and moors, where the grass is close grazed by sheep or rabbits and also on roadside verges, where the grass is regularly cut short mechanically. Thyme also grows in poor shallow soil, for example on screes, in chalk pits, on limestone pavements and in rocks beside footpaths. Usually thyme grows on south or west facing slopes which are sunnier. Our Thyme lawns however, are sited on the north side of a yew hedge which casts a surprisingly long shadow. Our heavy Wealden clay is clearly not their favoured growing medium, and if you add to this the fact that the area is prone to flooding through poor drainage of the moat, then you have some major obstacles to overcome in order to achieve sustained success. It was only 3 years ago that we dug over the area, adding plenty of sharp grit, before replanting with a variety of freshly grown thymes. This was not the first time (no pun intended); the lawns must have been replanted at least a dozen times since their creation in around 1950. Part of the problem may also be due to some visitors walking over the plants; this would appear to be evidenced by the concentration of dead or dying plants on the periphery. 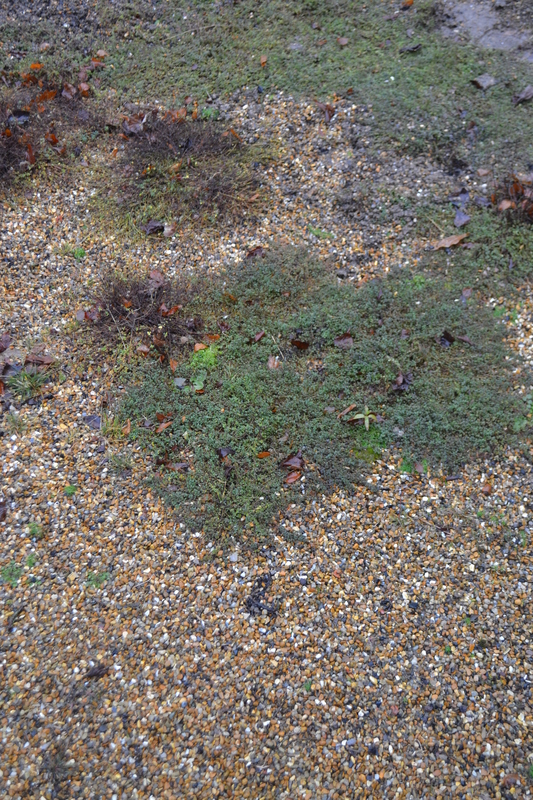 Whilst it is true that creeping thymes are able to withstand a moderate amount of footfall, this is normally the case when they’re planted in the small gaps between paving, where their soil is somewhat protected from compaction. Generally, the Thyme Lawns look really good about one or two years after planting but gradually start to deteriorate thereafter. The beleaguered Thyme Lawns this year. 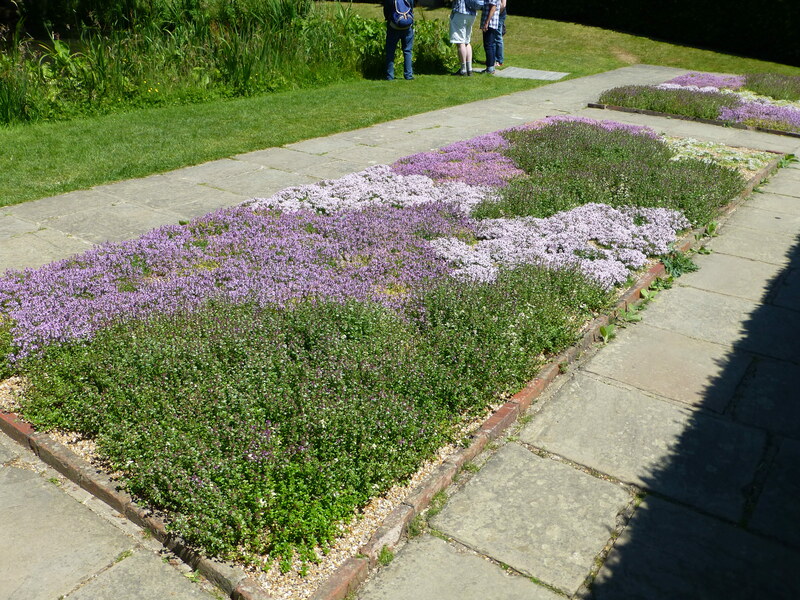 This year, having decided that the Thyme lawns once again needed replanting, Troy, my Head Gardener, asked me to take the opportunity to research the history of the Thyme Lawns, and see if we could discover what the precise, original planting and design would have been in Vita’s day. How prophetic that last sentence has sadly turned out to be. I had heard the lawns being described as a Persian carpet before, but to my mind this suggested a planting style that was not large swathes of solid colour as it is now (and has been for much longer than I have been at Sissinghurst), but one which was more of an interwoven, irregular pattern of colour. Vita also planted some bulbs within the Lawns, for interest in Spring ‘…when the thyme is merely green’. She used crocuses (not specified), miniature narcissus (perhaps N. bulbocodium) and some pink cyclamen (we might prefer the white). We like the idea, but it can now wait until next year. So, we now had a better idea of the thymes which Vita had used – just 3 different forms of purple, red and white; as well as a suggestion of how they were originally planted. 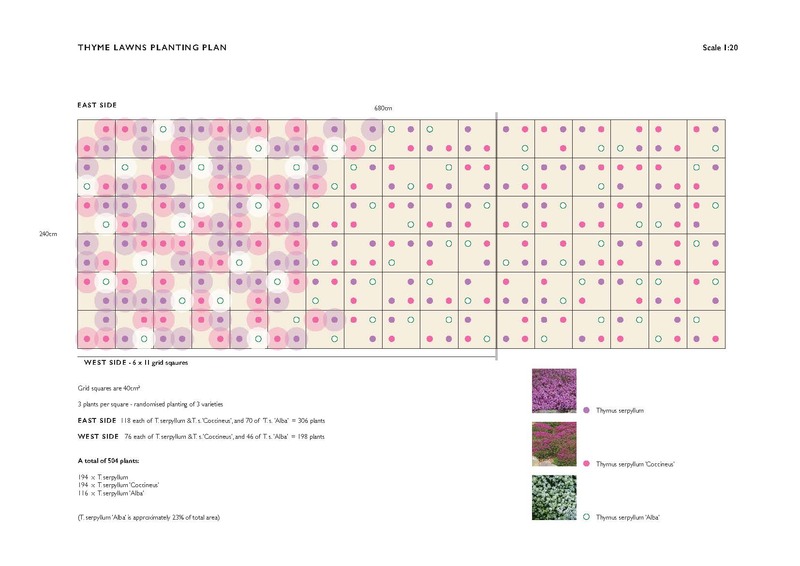 After discussing my findings and thoughts with Troy, he was happy to try a different planting style and asked me to produce a plan, whilst also finding a nursery which had the plants in the numbers we required. 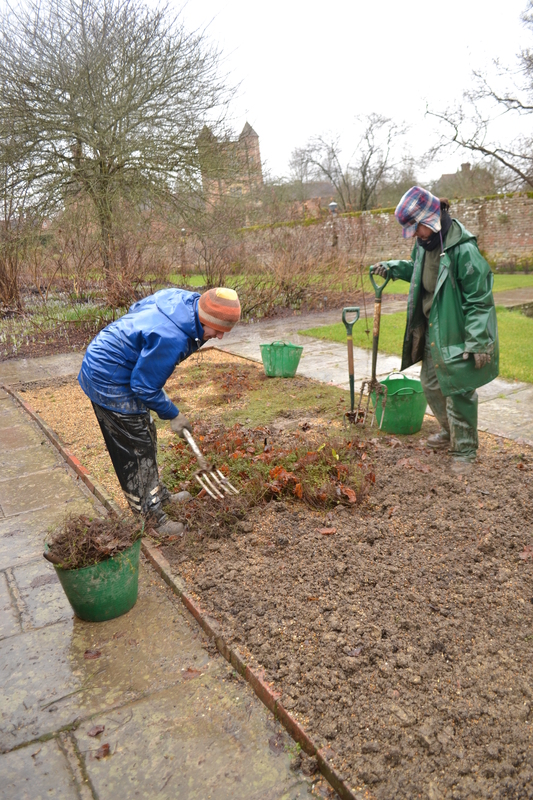 Liz, Claire and I began clearing the beds and digging in more grit, in preparation for the new plants. Claire and Liz clear out the old thyme. Troy and I also agreed to take the opportunity to utilise some of the healthiest surviving thyme and transplant it immediately into gaps in between the paving in the Herb Garden. I removed the mortar with a hammer and cold chisel and filled the gaps with a mix of sandy loam and sharp grit. It will be interesting to see how these plants fare in this new location – I’m hoping they’ll cope better with being walked on. Chiseling out the mortar before planting. Transplanted thyme in the Herb Garden. Something else which will help give the Thyme Lawns a fighting chance are the improvements to the drainage of the moat which were made earlier in the year; an acute angle in the pipes was re-laid as a much straighter run – this had previously been the cause of blockages and subsequent flooding. For the plan, I measured the Lawns and then divided the space up into 40cm squares. I placed 3 plants – one of each colour, in every square and then swapped their order around in each square. I also reduced the number of white thyme by alternately and randomly changing them to the red and purple, until the white thyme was only around 20% percent of the total planting. When we plant up, I will mark out these sqaures on the ground with string and canes and place the thymes exactly according to the plan. It might not be exactly how Vita did it, but I can only hope she would approve. I believe it will certainly be more reminiscent of a Persian rug – but not a literal representation of one either, that surely would not have been to her taste. After struggling to find a nursery which had enough of all three of the specific thymes we needed: Thymus serpyllum x 118, T. serpyllum var. coccineus x 118 and T. polytrichus subsp. brittanicus var. albus x 70, Troy suggested a nursery in Scotland, which he had used before – Macplants. Miraculously they had all three, in the right quantities and as slightly larger plants (7cm pots), which would be ready to plant out straight away. Originally we would have had to pot on the plugs and grow them on for a few weeks. They arrived in good condition just three days after placing the order and are now waiting expectantly, lined up outside the greenhouse in our nursery. We should be planting them out within the next few days.